Florida Leads Nation in Foreclosure Activity in 2012 | The Law Office of Emil Fleysher, P.A. Florida Leads Nation in Foreclosure Activity in 2012 | The Law Office of Emil Fleysher, P.A. The year 2012 was a good one for Florida’s home prices, however for the first time Florida surpassed Nevada to take the number one spot for having the most foreclosure activity in the United States. With a 53 percent increase in foreclosure filings for the year, some analysts worry about the effect this will have on growing home values within the state. Nevada, Arizona, Georgia, and Illinois follow Florida taking 2nd through 5th place for the most foreclosure filings in the year 2012. 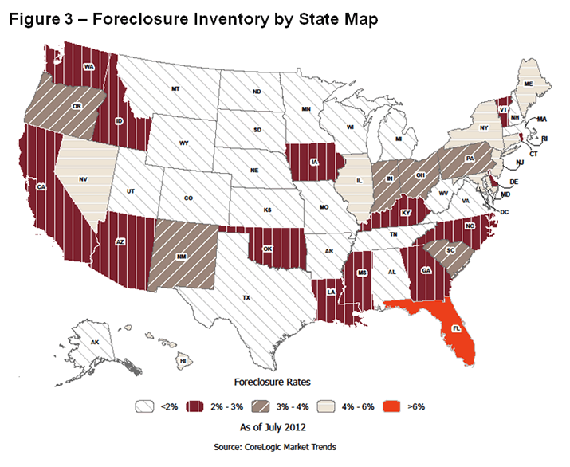 Florida was in 7th place for the most foreclosure activity in the previous year. More than 279,200 homes in Florida received a foreclosure filing in 2012. That’s approximately 1 in every 32 homes. Palm Beach County saw over 21,000 homes receive a foreclosure notice in 2012, up 16 percent from the previous year. The increase in Florida filings has multiple causes including slower foreclosure activity in other states and lenders making up for the time they were unable to foreclose on properties due to the robo-signing scandal. Increases in new mortgage defaults as well as bank repossessions(completed foreclosures) were also to blame for Florida’s increased rate. Nationwide the fourth quarter foreclosure rates were at the lowest since 2007. The increase in bank foreclosures should lead to a larger amount of bank-owned inventory for the year 2013. In many markets within Florida, this is seen as a good thing because of the large number of potential buyers. The problem this could create is a temporary flood of inventory which would cause home prices to fall. In 2012, prices of Florida homes state wide rose, including in Palm Beach County where median home prices rose 20 percent since the previous year. One unintended side effect of these increasing home values is that more home owners are now classified as being seriously underwater, meaning they owed at least 25 percent more on their mortgage than the home is worth. In January of 2012, approximately 2.6 million Florida homeowners were seriously underwater. In January 2013 that number has dropped to 1.9 million, but that is still 43 percent of all Florida homeowners with mortgages. Florida lawmakers will again be debating a fast-track foreclosure bill. This bill is intended to allow homeowners their due process while stopping properties from sitting in a foreclosure limbo. Florida ranks 3rd in the nation for the longest timeline to foreclose on a property, averaging at 853 days. New York foreclosures take an average of 1,089 days while New Jersey averages 931. Lawmakers will also be asked to extend a stipend awarded last year to the court system to allow more foreclosure judges to be hired. Since 2006, 1.5 million initial foreclosure notices were filed against Florida homes. Last year there were 155,938 new foreclosure notices filed, up 23 percent from 2011 and bank repossessions were up 24 percent.